Padme has announced they’re having an online Star Wars Spanking Party on Sunday! Star Wars and spanking just seem to go great together, Jedi masters are so stern and yummy. So naturally this sounds like an excellent party idea. I’m not sure if I’ll be able to make it just yet but I’d love to participate. If any of you are interested please go over to Journey To The Darkside and get the info. 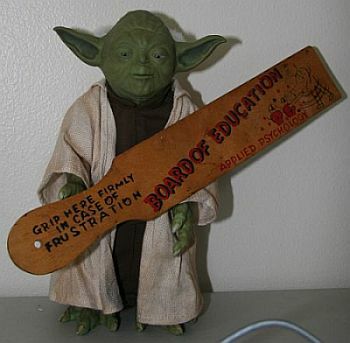 Don’t make Yoda put that paddle to use…or do, it’s up to you! I hope your able to stop by the party. I’m padmesavtar on yahoo if your able to drop by. I would really love to chat with you.